(Southern Metropolis Daily) The Factory Worker's Blog: A Huadu factory forces workers to memorize a standard script to deal with the client's inspectors. By Zhou Songbai (周松柏). In order to cope with the unexpected inspections by overseas clients, the Huadu Zhenghui company produced a "VF Corporation investigation questionnaire." The workers were ordered to memorize all the questions and answers, upon pain of having their wages withheld for any incorrect answers. Yesterday, our reporter went to the Zhenghui company in Huadu to investigate and verify the allegations of the workers. The Zhenghui Clothing Factory is located in Xinhuo village, Sandong Avenue, Huadu district, Guangzhou city. According to the worker named Ah Guo, the company distributed a "VG Corporation investigative questionnaire" to the workers more than two months ago. There were ten questions with answers listed on this sheet. The workers were ordered to memorize these answers. On payday, the people from the Finance Department and Human Resources Department would go down to the factory floor and quiz the workers. When a worker provides an incorrect answer, his pay would be withheld until he memorizes the answers and passes a re-test. Basically, the workers will not be paid until they get all the answers right. December 5 was payday but many workers have still not gotten their October pay because they gave the wrong answers. Yesterday noon, the reporter saw the "VF investigative questionnaire" that Ah Guo referred to. Nine of the questions pertain to the working conditions and wages for the workers. "Most of the answers are false. Look at this question -- all you have to do is stand around at the factory entrance and you will know that this is false." Ah Guo was pointing to question four in the questionnaire. This question was about the working hours, and the listed answer was: "Normal working hours are 8:00-12:00 and 14:00-18:00; If overtime is required, then 19:00-20:00 would be added; Sunday is a rest day; the longest weekly working hours over the past six months was 53 hours (including overtime); the work week runs from Monday to Saturday." According to Ah Guo, the true answer to this question is: "The working hours are 8:00-12:00, 13:30-18:45, 19:00-22:00/23:00/24:00; Sunday is just another working day; the work week runs from Monday to Sunday; each worker gets one day off per month." Yesterday was Sunday. At 1:30pm, the reporter stood at the factory entrance and observed the workers entering to work. A security guard confirmed to the reporter that the workers come to work on Sunday as usual. At the entrance to Zhenghui, a reporter intercepted several workers who were about to enter the factory to work. When worker Ah Cai was asked about the "VF investigative questionnaire," he said: "I have it with me" and he produced a questionnaire that was identical to the one that Ah Guo had. "I review it all the time because the inspections can take place anytime." Ah Cai said that he has memorized the answers down pat. In order to make sure that he gets paid, his wife forces him to review the answers regularly. "This is a nightmare," said another worker Ah Ping. The questions in the questionnaire pertain to the interests of the workers, but the answers are mostly false. "Every time that I memorize this, it felt like I just swallowed a fly." At 2:30pm yesterday, the reporter entered the Zhenghui Company. A security guard at the gate said that only workers were required to memorize the "VF investigative questionnaire," but the security guards were not. There was a notice about bonus pay posted on the factory wall: "On the 17th of this month, an overseas client made a sudden inspection of Zhenghui. Some of the workers were selected and two of them answered correctly. The company is rewarding each of these workers 50 yuan." The security guard said that the company does so in order to encourage the workers to memorize the answers in order to deal with the sudden inspections about working conditions and wages. Two weeks ago, Ah Guo who has only some secondary education started a blog under the nickname "The slave who knows to resist" (会反抗的奴隶”). He wrote all about the "VF investigative questionnaire." "I had no choice. I did not want to be manipulated by the company to give them a good reputation." Ah Guo said that he had thought about quitting, but he was concerned that the company would withhold his wages. He wanted to draw attention on the Internet so that the relevant government departments will intervene and investigate this matter. Yesterday, the reporter learned from the Ministry of Industry and Commerce that Zhenghui is a properly licensed clothing manufacturing company whose principal business is making denim clothing. The "VF Corporation" on Zhenghui's questionnaire appears to refer to the American company known as the VF Group. This is one of the largest clothing companies in the world and owns famous brands such as Wrangler, Hero, The North Face, Nautica, JanSport, Vans, Kipling, Reef, etc. Q1. When you begin work for the company, do you have to hand over your ID and/or pay a deposit? Does the company sign a labor contact with the worker? And who keeps the contract? Company's answer: Each new worker has to hand in a photocopy of the ID but no other fee is paid. A new worker signs a labor contact, and the factory and the worker each keep a copy. Worker's answer: Each person has to pay 50 yuan to begin work. 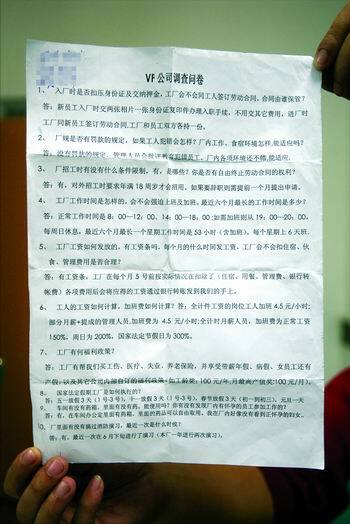 Reporter's finding: New workers have to pay 50 yuan in deposit, which is returned after two months. Q2. Does the factory have rules to fine workers for making mistakes? How are the working and living conditions at the factory? Is it decent? Company's answer: There are no rules to fine the workers. The managers will criticize and educate the errant workers. The conditions at the factory are decent. Worker's answer: The managers impose penalties at will. Reporter's finding: Unable to confirm at this time. Q3. Are there any hiring restrictions? If so, what are they? Do you have the right to terminate the labor contact on your own? Company's answer: Yes, the company will only hire people who have reached 18 years. If a worker wishes to resign, he must apply a month ahead of time. Worker's answer: There is no age restriction on hiring. If we want to terminate the labor contract, we will be forced to leave immediately and then one month's backpay will be withheld. Reporter's finding: When the worker is hired, there is a labor contact. But the original copy is with the factory and the worker only has a photocopy. Q4. What are the working hours? Are you forced to work or do overtime? Over the past six months, what was the longest working week? Company's answer: The normal working hours are 8:00-12:00, 14:00-18:00. If overtime is necessary, it will be from 19:00 to 20:00. Sunday is a day of rest. In the past six months, the longest working week was 53 hours (including overtime). The work week runs from Monday to Saturday. Worker's answer: Normal working hours are 8:00-12:00, 13:30-18:45; 19:00-22:00/23:00/24:00. Reporter's finding: On Sunday, the workers were working overtime. Each worker works at least 12 hours per day. Q5. How does the factory pay its wages? Are there standard rates? When are wages released each month? Does the factory withhold board and food fees? Are those fees reasonable? Company's answer: There is a standard wage scale. The company will transfer the appropriate pay to the workers' bank accounts on the 5th of every month after deducting the various fees accordingly. Worker's answer: There is no standard wage scale. The fees (board, food, management) are arbitrarily imposed. Reporter's finding: There is a standard wage scale, but it does not spell out the actual wage or overtime wage. The wages are sometimes paid late. Q6. How are the wages calculated? How much is overtime pay? Company's answer: The overtime pay for the workers who get paid by the piece is 4.5 yuan per hour. For certain managers who earn monthly pay+incentive, the overtime pay is 4.5 yuan per hour. For hourly workers, the overtime pay is 150% the normal wages; the overtime pay on Sunday is 200%; the overtime pay on national holidays is 300%. Worker's answer: The overtime wages for the workers who get paid by the piece is 0.3 yuan per hour. Reporter's finding: The reporter questioned some of the workers who said their overtime wages were 0.3 yuan per hour. There is also no overtime wages on Saturday and Sunday. Q7. Does the factory offer any benefits? Company's answer: The factory helps its workers to purchase insurance for industrial injuries, medical care, unemployment and retirement. We enjoy paid annual holidays and sick leave. Female workers have maternity leave. The company also offers its own corporate benefits (such as 100 yuan per year upon completing another year; 100 yuan for the most productive worker of the month). Worker's answer: There are no company benefits whatsoever! Reporter's finding: The workers do not have any insurance cards for medical care, unemployment, etc. Q8. How are the state holidays implemented? Company's answer: Three days off on May 1st, October 1st and the Lunar New Year; one day off on New Year's Day. Worker's answer: One day off on May 1st and October 1st. No holiday on New Year's Day. Reporter's finding: The worker is right. Q9. Is there a medical treatment kit on the factory floor? Is there any medicine inside? Is it useful? Have you seen pregnant workers working overtime? Company's answer: There is a medical kit in the office for the factory floor. The workers are free to use the medicine therein. I have never seen any pregnant women at the factory. Worker's answer: The factory does not provide any medicine whatsoever. There are pregnant women at the factory. Reporter's finding: Ah Guo's wife is two months pregnant and she is still working at the factory. Some of the workers confirmed that there are pregnant female workers. Q10. Are there fire drills at the factory? When was the last time? Company's answer: Yes. The most recent one was in late June (we hold two drills per year). Worker's answer: There has never been any drills whatsoever. There hasn't even been any public lecture on the subject. Reporter's finding: This remains to be checked.